MAGGIE BELL was born in Glasgow in 1945 and started her professional career at the city’s Locarno Ballroom at the age of 17. In 1969 she teamed up with guitarist Leslie Harvey and eventually formed the band named (by Peter Grant) Stone The Crows. After Les was tragically electrocuted when sound checking at Swansea’s Top Rank ballroom, Maggie and her friends were so devastated that they never really recovered, and the band split in 1973. Maggie then enlisted the help of veteran producer Jerry Wexler with whom she recorded two solo albums. 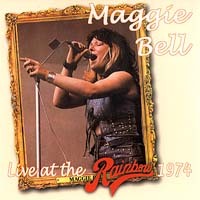 This fascinating Angel Air release documents Maggie’s promotional tour of 1974 when she debuted songs which would feature on the 1975 album ‘Suicide Sal’. At the time Maggie was riding on the crest of a wave professionally having been voted ‘UK female vocalist of the year’ for the fifth year running. The Rainbow gig comes from bassist Mo Foster’s personal archive. Other musicians in Maggie’s band are ace sessionist Pete Wingfield (keyboards), guitarist Brian Breeze and drummer Paul Francis. This CD marks the 100th title from Angel Air and coincides with the label’s fith anniversary. It is the first-ever ‘live’ album release from the ‘Queen Of The Night’ and the accompanying booklet features never-before-seen photos and informative sleeve notes from Mo Foster. …the sound quality is surprisingly good for a live recording of this vintage. …this concert catches her in her prime. A fabulous band powered by keyboardist Pete Wingfield, they clearly had a ball…lovers of the likes of Free's 'Wishing Well' and The Sutherland Brothers 'I Was In Chains' make one pine for another of her ilk. Bell's powerful yet soulful vocals suit the mix of blues, rock, R & B and pop in which she dabbled very well and this set encapsulates her rightful claim to be judged as one of the UK's top female singers of the times…The closing number, 'Shout', is so fast and passionate that Maggie all but brings the house down. A fantastic archive package. The encores show that the band is having a party and everyone is invited. Plain good rock and roll lunatic fun that has transferred well onto this compact disc. This is Angel Air's 100th release, and they have made the ton in great style. This is a fine album from a great performer. I just love it. …Maggie's larger than life personality totally dominates the proceedings. The track listing boasts fine covers of Free's 'Wishing Well'…alongside a splendid Pete Wingfield inspired 'Soul Medley'. Here's one of the finest female voices to come out of the UK. Stone The Crows promised so much, but that's another story in their cruelly too short existence. This set comes from the personal archive of band member Mo Foster [bass].... There's good bass lines in Wishing Well as Maggie gives the song her own treatment...the first half of this CD is worth the price alone.